Have you ever heard the term, “Change your lifestyle without changing your address”? With home renovation becoming more and more popular, many people are choosing to renovate their existing home rather than move. And one way you can improve your home while adding to your lifestyle, is with a new Adelaide carport. Sure, a carport is a great investment in itself. It will protect what’s likely to be your second biggest asset from the elements, as well as protect you and your family when getting in and out of your car. But if you only use your carport for a place to park your car, you may be missing out on some key benefits. 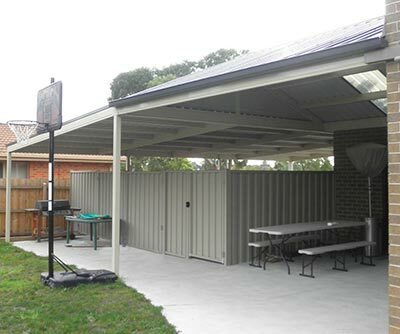 Take the example of this Mr Carports’ client, who wanted both a carport and an entertainment area. Rather than split the structures, the decision was made to join them to create one large dual-purpose area. For safety and convenience, the areas are split by a metal fence. The materials, colour and roof style were all chosen to complement the existing modern brick and rendered home. This family now has space for two cars, a barbecue, seating, heating and enough room for a party. If you’re not lucky enough to have this much space, you can still make your Adelaide carport a dual winner with a little clever thinking. While you can of course move your barbecue and outdoor furniture to your Adelaide carport after the cars have been moved, if this isn’t practical or is simply a pain, another option may be to incorporate a storage area in your carport. Even a small space will be big enough for a barbecue and fold-up furniture, that can easily be set-up before the guests arrive. Integrate some form of screening into your carport, to add privacy and reduce the effects of wind. Consider adding a roll-up door to your carport or, for less money, outdoor blinds. If your entertaining is likely to go into the night, install lights in your carport. These can either be wired to the mains or you can run an external extension lead to your nearest powerpoint. If you’re ready to improve your lifestyle and your home with a new Adelaide carport, Mr Carports is ready to help. Whether you’re after a carport that will double as an entertainment area or simply want a carport to protect your cars, Mr Carports in Adelaide has the ideas, knowledge and skills to make it happen. Phone Mr Carports today on 1800 557 782.